The use of fossil fuels has increased the standard of living of most of the world’s population over the past century, but as a result, climate change has blurred the future. It is clearly becoming necessary to reduce greenhouse gas emissions. Carbon dioxide (CO2) is an indicator of several greenhouse gases (methane, F-gases, nitrogen oxide – called CO2 equivalents). About 90 percent of CO2 emissions caused by people are due to fossil fuels, and the rest are caused by agriculture and industry. On average, every EU citizen annually produces about 9 tonnes of CO2. The goal of the EduFootprint project (a 28-month modular Interreg MED project, co-funded by the European Regional Development Fund) is to improve the competences of owners and managers of public buildings, in particular educational institutions, for more efficient use of energy, thereby reducing the environmental footprint of these buildings. 53 facilities are part of the project: kindergartens, primary and secondary schools, and university buildings. Buildings are in the project’s focus because we spend 90 percent of our time in them. They therefore need to provide us with a quality indoor environment and at the same time must be designed in a way to minimise their environmental footprint. In the case of schools, this is first connected with the construction process, while in the operational phase the environmental impact is related to the use of energy, mobility and other activities, including food. Buildings consume approximately 40 percent of energy in the EU and are responsible for one third of the emissions. Energy efficiency means that we do more with lesser energy use: an energy-efficient building consumes less energy and causes a lower environmental footprint. In order to compare the efficiency of school buildings, we can calculate the energy consumption per square meter of the building’s surface or in proportion to the number of pupils, and the environmental footprint of the school can be determined based on energy consumption and emission factors such as the amount of CO2 in kilograms. In the EduFootprint project, they developed the Edu-points model, an original way of determining the overall assessment of the impact of the school on the environment. The calculation takes into account the parameters of school CO2 emissions: heat, electricity, mobility, and paper use. School buildings are then ranked on a scale of 0 Edu-points (unsuccessful school, excessive environmental impact or excessive CO2 emissions) to 100 Edu-points (exceptionally efficient school). In order to better understand the environmental impact of buildings, a smartphone app was also developed within the EduFootprint project. The demonstration of energy consumption and related CO2 emissions helps the school communities understand the impact of various factors on the environmental footprint of the educational process. 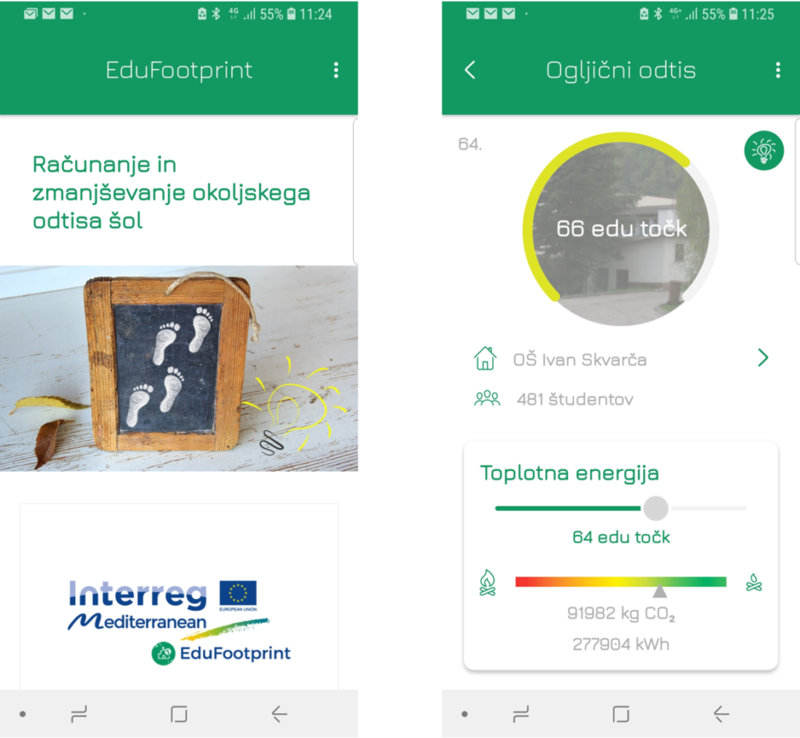 The EduFootprint app has a user-friendly interface where users can easily see the environmental footprint of the chosen school and see how many kilowatt hours of energy the building consumes, the consumption of kilowatt hours of electricity, and the use of paper in kilograms. The data from the participating schools enables us to compare their energy efficiency, while the interactive part enables the users of the app to learn about the different factors that influence energy consumption and greenhouse gas emissions. Edu-points are calculated on the basis of normalisation of each parameter (energy or number of pupils), according to the highest value of this parameter from all test schools. The total score of Edu-points for the selected school is the sum of the points of each parameter taking into account their impact. This helps users understand which the most important CO2 emission parameters are and where it is sensible to act first (the principle of the “low-hanging fruit”). By moving the slider, we can then test the influence of individual factors and monitor the changes in Edu-points: a greater number of points mean lower energy consumption and lesser environmental footprint of the building. EduFootprint is designed for Android smartphone users and is available at https://play.google.com/store/apps/details?id=si.specto.edufootprint. It can also be found in the Google Play Store under keyword: edufootprint.